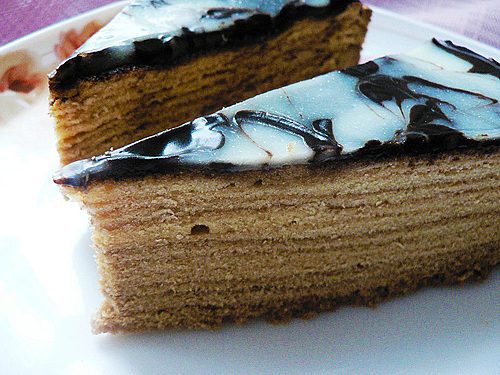 Baumkuchen -- the King of Cakes! A true test of a pastry chef's skills, the Baumkuchen has earned its reputation as the "King of Cakes." This labor-intensive specialty gets it name, which translates literally as Tree Cake, from the many thin rings that form as layer upon layer of cake is baked. For more than 200 years German bakers have been producing this treat by placing a thin spit over a heat source, originally a wood fire, then evenly brushing batter over it, giving each new layer a chance to bake to a golden brown before brushing on the next. When the cake is removed and sliced, each layer is divided from the next by a golden line, resembling the rings on a crosscut tree. Skilled pastry chefs have been known to create cakes with 25 layers, weighing over 100 pounds and measuring more than 3 feet long. The recipe here is adapted for the home baker and uses a springform pan instead of a spit. Of course the ring effect won't be exactly the same, but the taste is still worth the effort and you won't have to spend your Christmas holiday cleaning drips of burned batter off the oven. Whip butter and sugar well until creamy. Gradually add egg yolks and the remaining ingredients to the butter-sugar mixture until a light, foamy batter forms. Beat egg whites until very stiff and stir gently into the batter. Pour about 2 tablespoons batter (a thin covering) into a 8-1/2" springform pan greased with butter. On the uppermost oven rack, bake (or broil) in a preheated oven at 450° F for 2 minutes or until golden brown. Watch carefully, this browning can take place very quickly. Repeat until all the batter is gone -- you should have about 14 to 16 layers. When the cake is done, let it stand a few minutes before running a sharp knife along the sides of the pan. Remove the cake from the pan and glaze with melted apricot jam. Once the jam is set, you can add an additional glaze of thinned almond paste or immediately finish the cake with a thin icing made from powered sugar or your favorite chocolate, melted with vegetable oil.